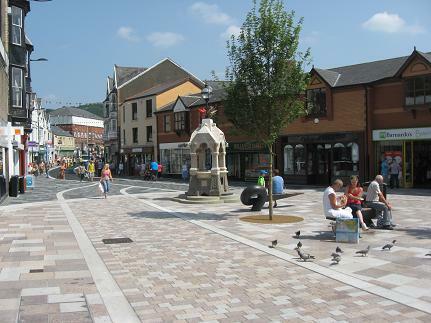 Pontypridd has benefitted from its largest cash injection thanks to Rhondda Cynon Taf Council. By securing a financial package of £10.5million the regeneration of the town centre street scene has been completed and the impressive transformation is there for all to see. Penuel Sq afterThe project was delivered alongside a whole host of private sector investment programmes in the town, which means that a £85million masterplan is regenerating Pontypridd. The Council project has included new paving, road surfacing, street furniture, signage, lighting and distinctive factors. Paved areas in the town have been widened, creating a more desirable town centre. Key public spaces have been developed with significant spaces such as Penuel Square being enhanced and maintained as areas of focus. It has also allowed improvements to the internal and external parts of their business premises. News that the much-loved Pontypridd Lido will be regenerated has been much welcomed by residents and visitors of the County Borough. Over the next two years a state-of-the-art facility will be created that will welcome tens of thousands of people to the famous valley town. Through this website we will bring you all the up-to-date information regarding the regeneration of Pontypridd and the many events and activities organised by Rhondda Cynon Taf Council and its partners to further enhance the popularity of the town as a major destination for the 21st century.